What kind of distribution support do we provide? We don't believe in minimum or maximum orders. Whether a single item or multiple items are needed, our system supports any level of order requested by our retailers. And our focus is to make it as easy as possible. Our system includes automatic alerts, shipment tracking services and same-day delivery when possible (usually before 2pm). There is almost never a need to wonder where an order might be and when it will be delivered. We know we have to provide reliable delivery to help every single retailer get their supplies on time. 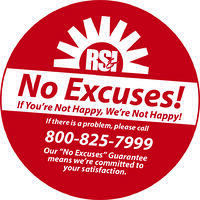 Our personal guarantee means complete retailer satisfaction – we won't rest until everyone is happy! We chase the problem until it's resolved to put quality products and services into the hands of our retailers. A variety of installation hardware and accessories have been pre-approved for DISH and HughesNet authorized retailers to purchase directly from RS&I. Excellent pricing is also available for RS&I branded hardware and accessories to provide retailers with plenty of options. Look no further for your hardware needs! Each of our branch locations offer a complete inventory of the partner approved hardware and accessories mentioned above. Shipping is coordinated through these warehousing facilities located in the western U.S. for fast and dependable delivery services. As you can see below, our corporate office and main warehouse is in Idaho Falls, Idaho. 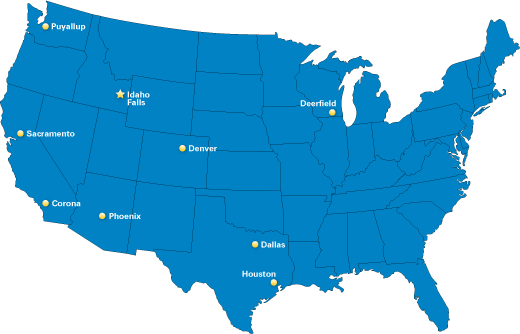 However, we have strategically spread out our nine distribution centers to serve the western half of the United States and a network of more than 3,000 authorized retailers. To sum it up, closer access means increased sales training, easy equipment pickup and additional savings on shipping. Not only are these nine warehouses providing reliable delivery and service, but we also have a team of sales professionals at each location. It's an extraordinary combination of distribution and sales that is designed to give a high level of legendary service to our valued retailers. All those who work with RS&I can expect a customer-centric attitude, a spirit of teamwork, and absolute dedication to exceeding every expectation. As small business owners team up us, we do our best to make their ventures successful. It's all about our vision to help thousands of retailers, their employees and all of their families to find prosperity in today's economy. And we find a lot of joy in pursuing our vision and goals. If you'd like to explore the opportunities available with an RS&I partnership, please fill out our brief contact us form. The questions in the form help us understand where you're located, if you currently own a business and which authorized retailer program(s) you'd like to pursue.